At Wee Warhols we make tons of recycled crafts. We save all of our jars, lids, cardboard, paper towel rolls, etc. so that they may one day serve as a fun element in a creative project. We even welcome other people’s “trash”. This has gotten a little out of hand at times, especially once my boys became supporters of the cause! It is now to the point that before throwing anything away, they ask me first if we need it for art class. It’s actually pretty cute, but as you can imagine, they have offered to save some pretty gross trash. For instance, they bring home old banana peels in their lunchboxes to make something with. (Side Note: We need to start a compost pile.) Of course there are plenty of times where this practice of hoarding has worked out exactly as intended! For example: Not long ago, a friend donated a bunch of long thick paper rolls to Wee Warhols. I knew right away that I wanted to make rainsticks out of them! The rainstick is a percussion instrument. Legend has it that the Aztecs or Chilean Indians played them in the belief they could bring rainstorms. Rainsticks are usually made from cactus, using pebbles or beans, and pins or thorns to make a sound reminiscent of rain falling. Instead of cactus, we used thick cardboard tubing. If you can get your hands on carpet rolls or any other rolls of the same thickness that would work as well. For the filler I made a pitcher filled with an assortment of variously sized dried beans and rice. 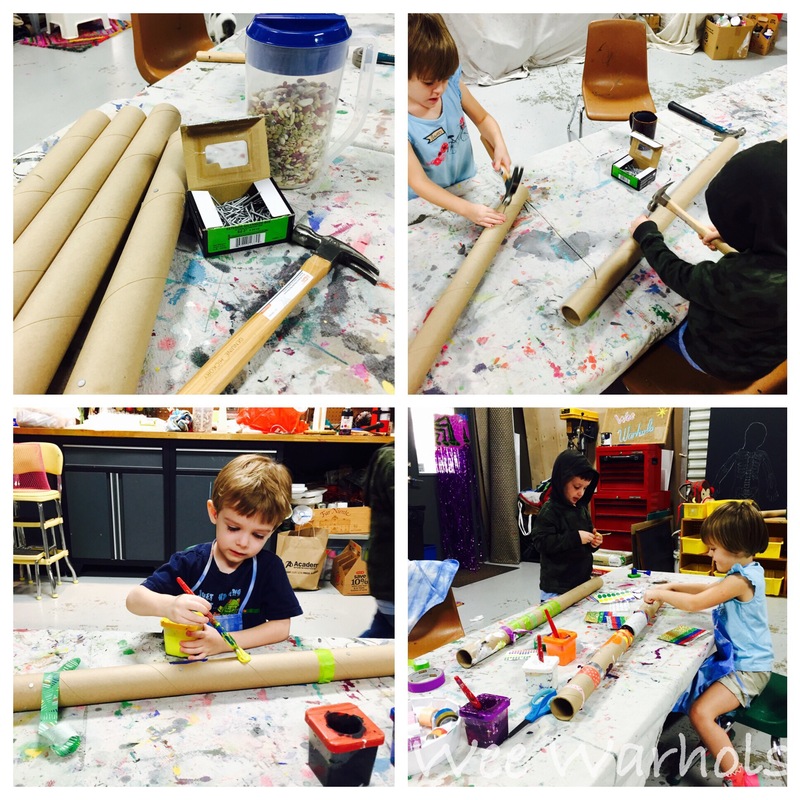 The paper rolls were thick enough that we were able to hammer nails in all directions to help create the rain sound when the beans moved through the tube. I like to use nails with large heads to give the kids a larger target to aim for. We used 1-1/4″ ring shank, flat head nails usually used for roofing. I closely supervised the children with this step. 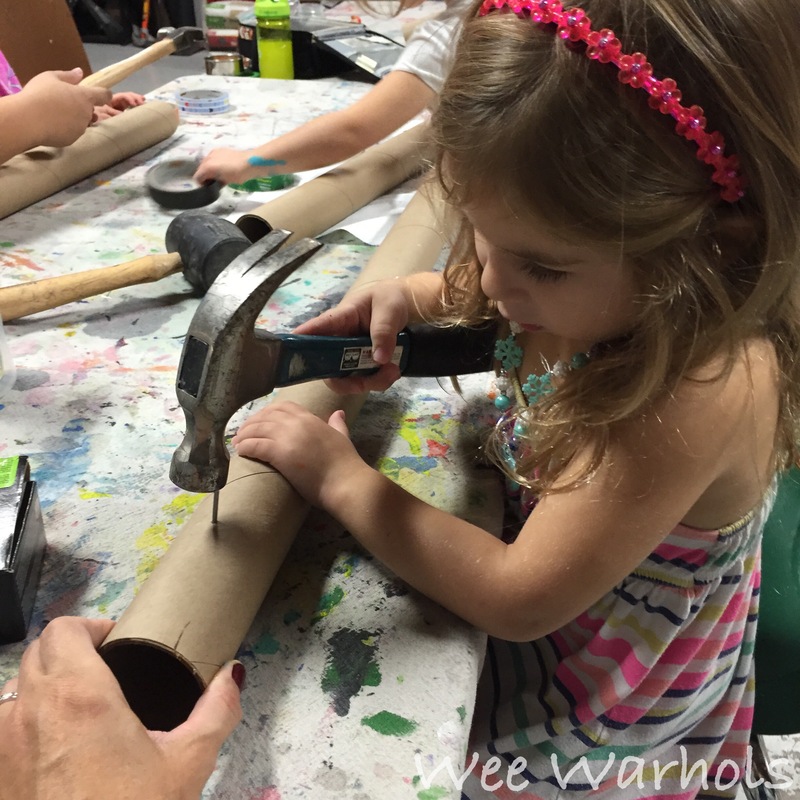 I feel that allowing children to use tools like scissors, hammers, and nails builds confidence. Projects like this give us a chance to talk about safety and the proper use of tools. When you look down the tube it should look like a starburst of metal, in various sections along the tube. In one of my classes we closed off the ends of the tubing with pieces of felt and rubber bands. After some heavy duty rain dancing and a few spills, we tried another method. I cut a balloon’s tail off and we slipped the balloon around the opening. This worked wonderfully! The kids poured the filler in once one of the ends were closed off. 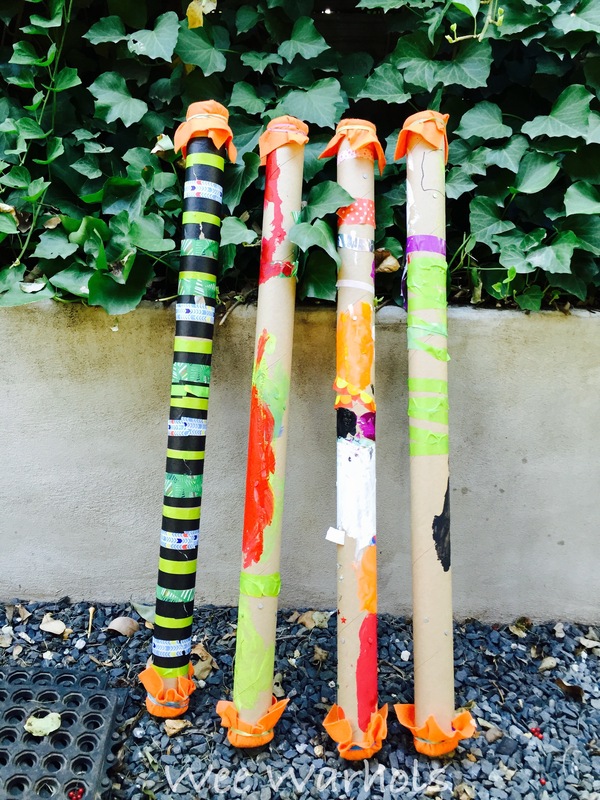 The Wee Warhols used tape and paint to decorate their rainsticks. 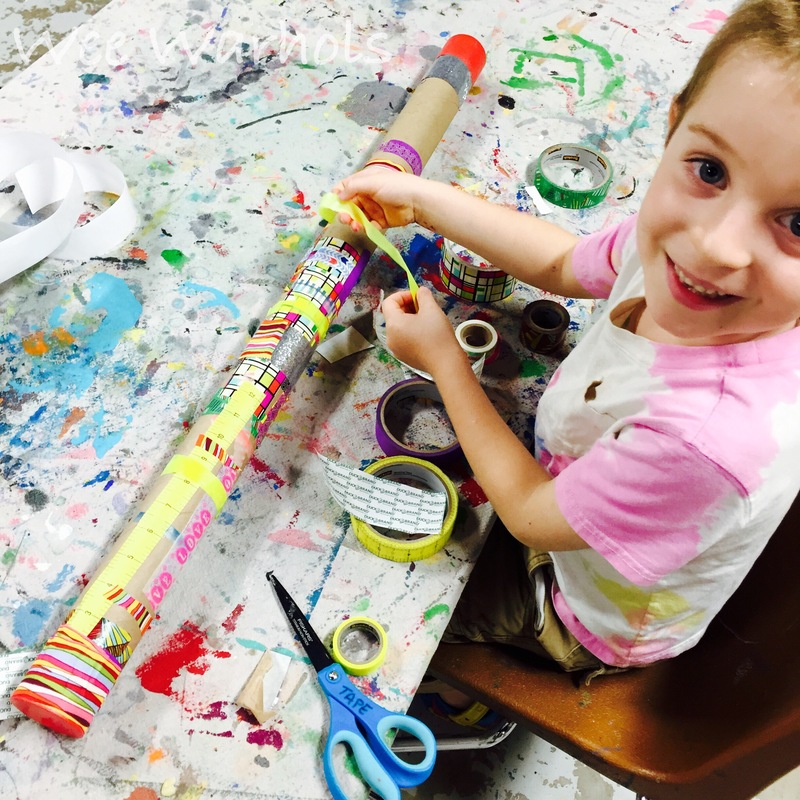 If you are worried that your little artist won’t be able to wait for the paint to dry, you could just stick with tape (pun intended) or another dry method to adorn their instrument. 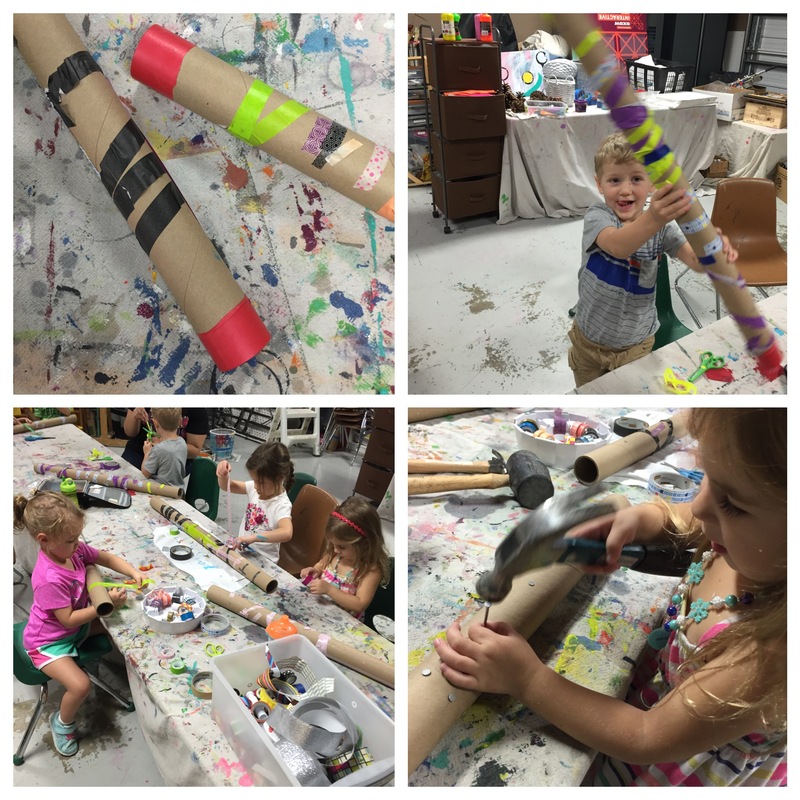 It is so fun to see the kids’ excitement when they proudly say things like, “I made this from a toilet paper roll, “or something else that they would normally discard. They are giving these materials a second life. If you live in Austin, Texas and don’t want to hoard “trash” like I do, (but care about our community and like to create) you need to check out Austin Creative Reuse. Another good resource that I have found in Austin is SpinFish. SpinFish partners with large events like SXSW with a mission to keep trash out of landfills.